**Before I start about today, I added a picture to yesterday that I forgot. It was one showing the leaves filling in a bit in lower elevation. It was the first day that spring was really evident. It disappeared in higher elevation, but it’s coming! This morning was the first morning that I set my alarm on this trip. I set it for 5:45am, packed up in the dark, and was hiking by 6:30am as the sun was rising. I knew today had a lot of ups and downs and I wanted get started early to make it 25mi so I could end the day at the Fontana Dam Lodge. Skittles was still in his tent and Tumbles was packing up when I left. His goal was to make it to the lodge to split the room with me if he could. 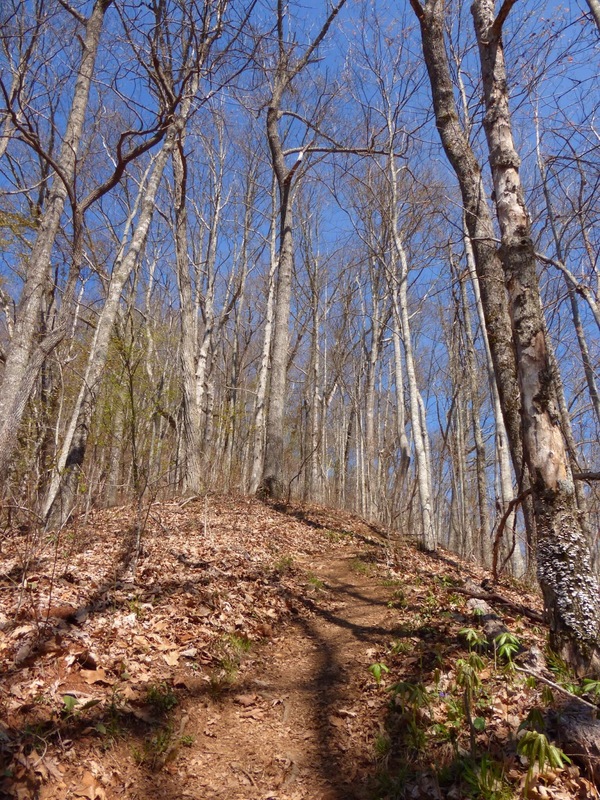 Nothing can express the steepness of some of the climbs today, but I want to try. 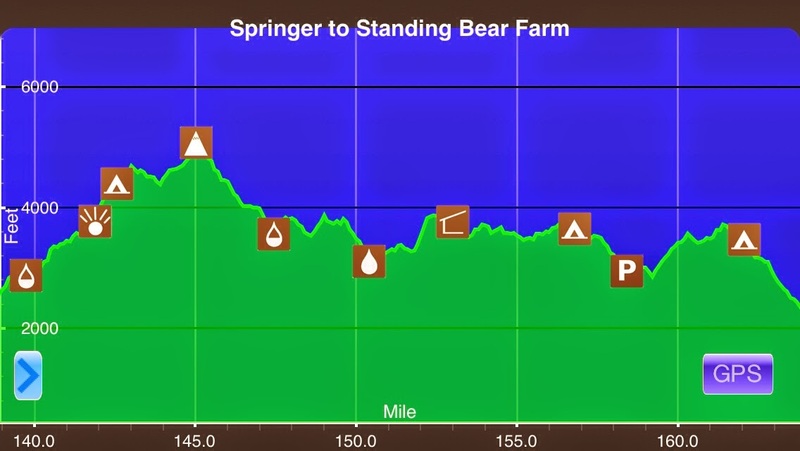 Here is a snapshot of what I hiked today from the app I use called Guthook’s AT Hiker App. I mentioned it in more detail in my preparation posts, but he has apps for the PCT, CDT, and AT and it’s great to have. 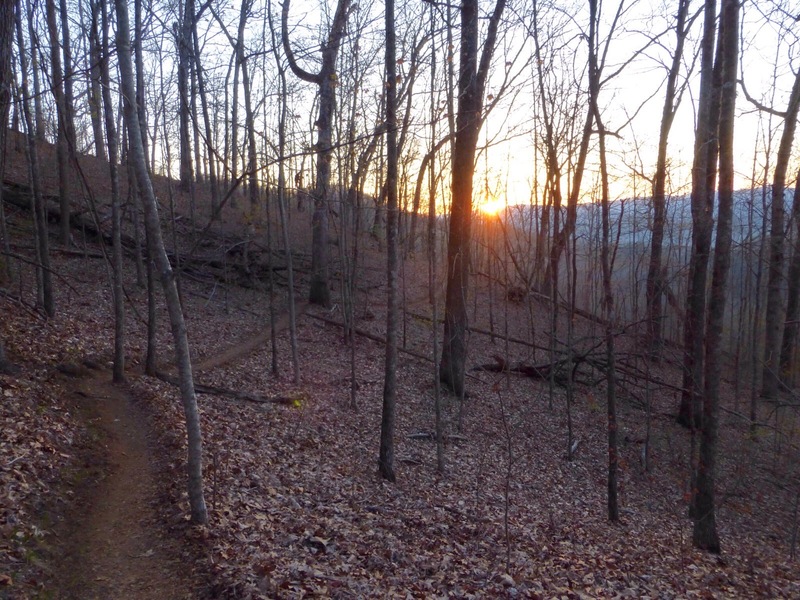 As I mentioned, I started off just as the sun was coming up over the trail behind me. It was a great morning and within an hour I was hiking with just a tee shirt and shorts…it wasn’t until halfway through the morning that I noticed I had my shirt on inside out since I got ready in the dark, ha! One of the first things I saw today way a memorial for a fallen firefighter that had died fighting a fire in this very area. 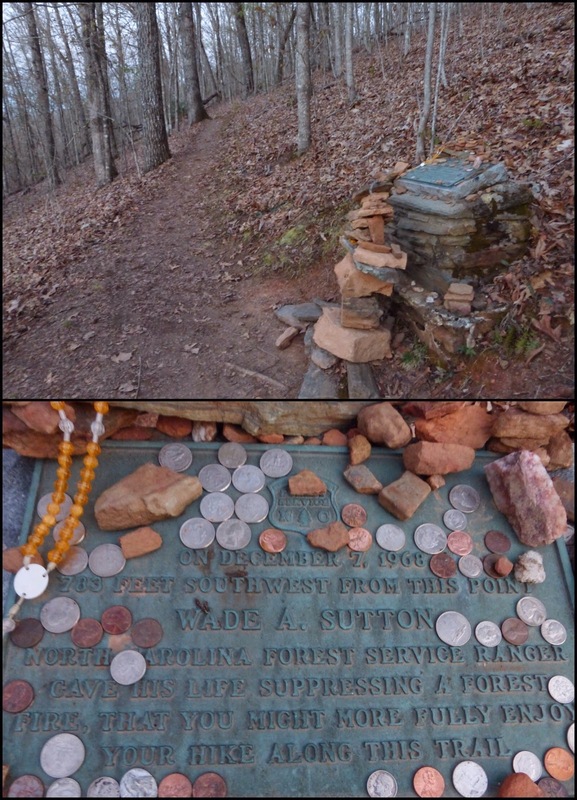 Many rocks were laid around it and coins covered the plaque. The morning climb was a steep one that went up for the first five miles this morning, whew! Along the way, I passed a couple hikers. Most seem to have stayed at a shelter a bit before the top and were all gathered at the top of Cheoah Bald when I got there. It was an expansive view and was a nice reward for the morning climb. It was windy and colder on top and another hiker was using his GoLite umbrella to crouch down and stay warm. 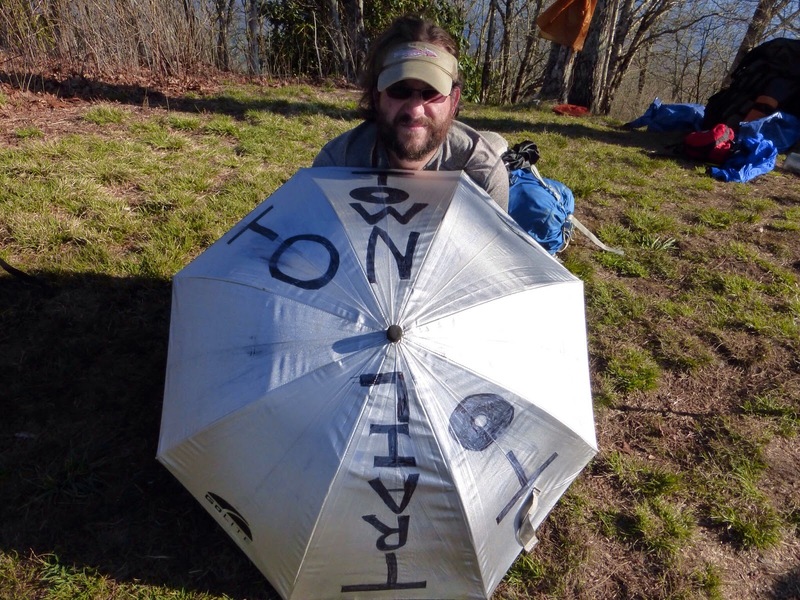 Yet another great use of the umbrella! His name was Stitch and he even found a way to use the umbrella to help him with hitchhiking. I walked alone most of the day, but saw at least 20 hikers today. Definitely getting closer to the herd. All my encounters were a brief hello as most of the day was steeply up or down and I was going through it fairly quickly. It’s difficult to photograph the steepness, but I tried. They were leg burners today, but I am still finding myself to be going up them swiftly. 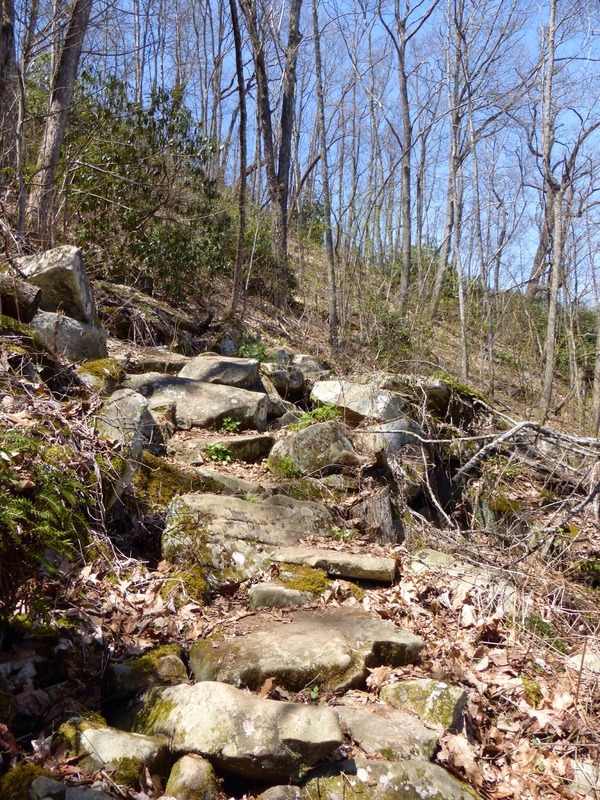 For some reason, I’m not getting out of breath going up them, but I feel the burn in my calves. All other days I felt like there was a gentle downhill or level to balance out a steep up, but that didn’t happen today. There were also rocky stretches that required focus to make sure I stepped in the right place. I was glad it was a dry day. So I have to say that I was quite bored today. These days happen from time to time and I know it’s temporary. I think it was the change from all the views yesterday and the fact that tomorrow I’ll be entering the Smokies! The morning went by quick, but by the time I finished lunch, I was over it. I don’t know if it was my visions of the lodge or just that I’m tired of seeing the same thing all day…dried leaves and bare trees. I tried to distract myself in many ways. I finished the audiobook, “The Fault in Our Stars.” It was sad, but I was still glad I listened to it. I’d rotate radio, mp3 player, and listening to the sounds of the trail until I walked up on someone and I’d talk to them briefly. After lunch, I decided I needed something more to distract me, so I focused on all the flowers popping up through the dead leaves. I took pictures of each and that was fun. Feel free to identify them for me! In the afternoon, I walked up on a couple that I got to hike with for an hour before they stopped at a shelter for the day. It was fun to get to know them and it helped to pass the time. Their names are Learnin’ and Roots and they are from Oregon. They have updates on Facebook at www.facebook.com/theoverlandersat. When we got to the shelter they were going to camp near, I saw out of the corner of my eye something fall from the rafters of the shelter and hikers messing with something. It was a MASSIVE black snake about 4ft long. Learnin’ said it was a harmless black rat snake and moved it to a safer spot, but it was sadly injured by a hiker that had hit it. It was a bummer, but also totally freaked me out! I really don’t like the shelters! I was excited that I made it to Fontana Dam by 5:30pm and a shuttle to the lodge showed up almost immediately. I tried to be as efficient as possible to do my resupply, shower, laundry, and dinner. It all went by so fast that I forgot to get pictures of the area. I’ll try to do that tomorrow. It was a tiring day and more tiring knowing I need to get all these chores done. I’m hoping to relax til noonish tomorrow before leaving. Tumbles(pictured yesterday) showed up around 8pm tonight and is the perfect roommate for me, so it’s nice to split the room with him. He’ll be taking a zero tomorrow, so I won’t hike out with him. 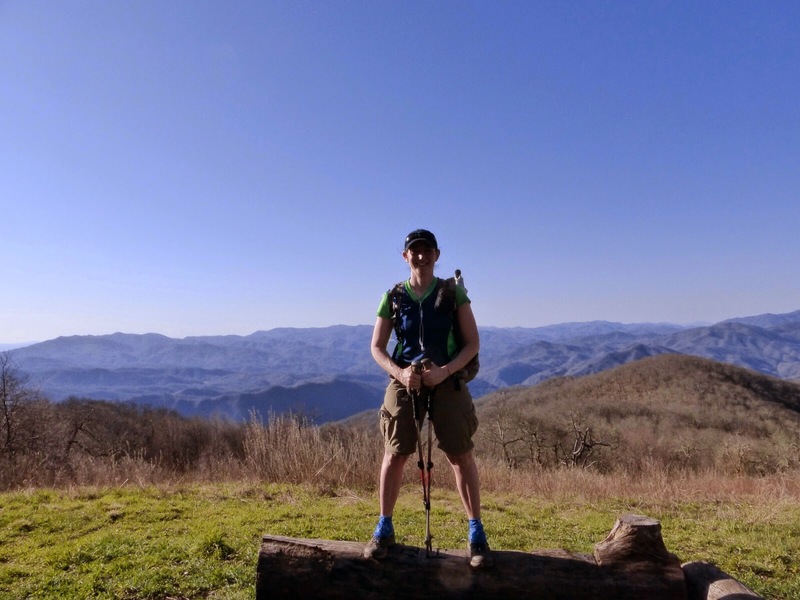 Tomorrow I enter the Great Smokey Mountains National Park! I’m pretty excited about this, but also apprehensive. There are mandatory shelters to stay in, but I’ve heard they are nice stone ones. 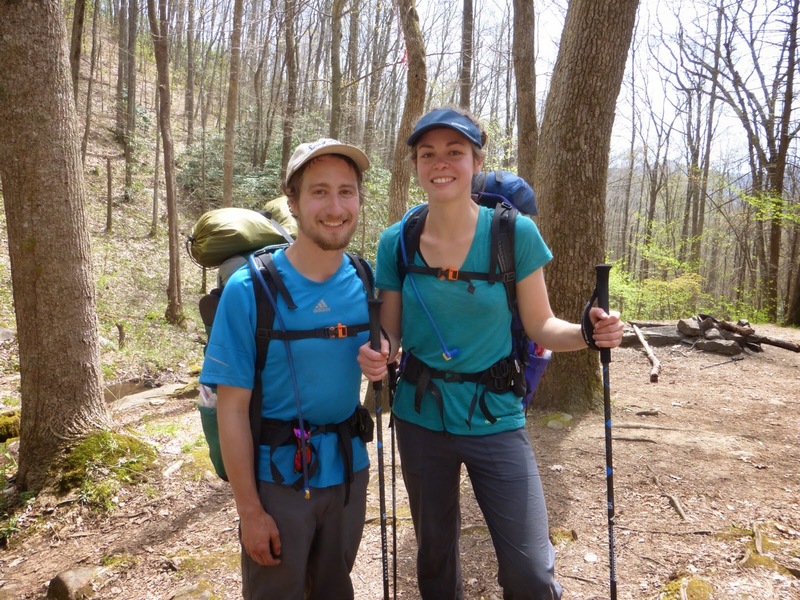 The word is that thru hikers are the only ones allowed to tent, but that is only if the shelter is full. I’ve yet to walk by a shelter that isn’t full on this trail after 5pm, so I’m hoping I get to tent! Phone reception might be limited out there for the four days I got through, so I’ll load the posts up as soon as I can get service. Don’t worry if they are delayed a day or two. Smokies here I come! Having grown up on the AT, I recognize your flowers and they remind me of home. 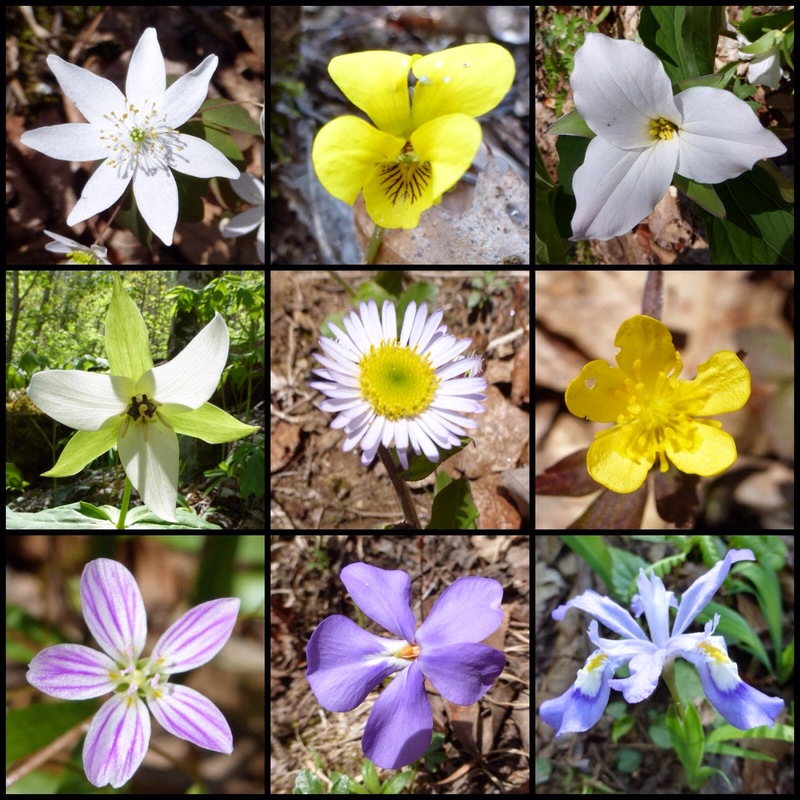 L to R, top to bottom: Bloodroot, Yellow Violet, Large-flowered Trillium, Trout Lily, likely an Erigeron, a Cinquefoil, probably Dwarf at this time of year, a Spring Beauty, either Carolina or regular, Birdsfoot Violet, and Dwarf Crested Iris. Beautiful. Makes me homesick for my AT. Aw, thank you Mountain Goat!